When I saw this book I was excited to see something of its ilk available. 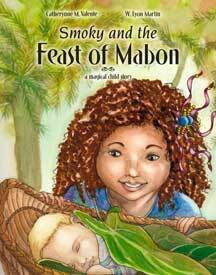 Smoky and the Feast of Mabon was written by Catherynne M. Valente and W. Lyon Martin. It’s the story of young Smoky, and her journey through Mabon. It’s written for children about 5-8 and has very beautiful water-colored pictures illustrating every page. The story is thusly simple; easily understood by young children. I was also very happy to see that while there certainly is the Pagan undertone in the story of Mabon it is also open enough that after reading the story, parents can then easily translate the story in the book to whatever Mabon practices they celebrate in their home. The story follows Smoky as she is upset that her flowers are dying. She wanders into the trees behind her home and encounters a large feast where she meets the Lord and Lady. They explain to her that while everything does die in the fall, it is then reborn in the spring. After the feast Smoky goes home and tells her mom that she’s not sad anymore, that she knows the flowers will grow again in the spring.